Changing your keyword is very simple and easy. You jsut need to login to your account by the User Id and Password provided by us. After login to your account there is a link by the name of MY KEYWORD . On click on this link you will be redirected to the page from where you can change/Update your Keyword. You can set your Search Preference based on your requirement. You can also check online what type of email you will able to receive for difference search settings. 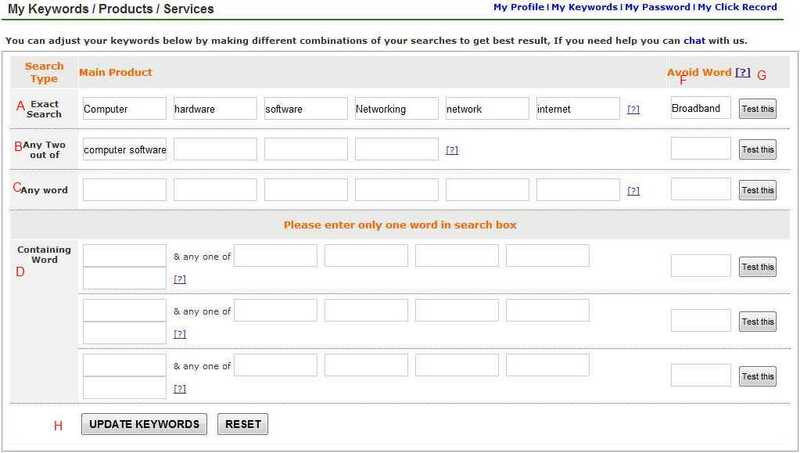 A Exact Search : Tenders related to the Exact Keyword/Product that you type in this Search Box. B Any Two Words Search: Tender(s) related to any of two words which is mentioned in this search box. C Any One Word Search : Tender(s) related to any words which is mentioned this search box. D Containing Word Search : Tenders related to combination of word(s). The will contain the common word of combination. E Avoid Text: Avoid word(s) from search. E Test Email : You can see which type of result / email will come after putting keyword / product. G Update Keywords : Click Update Keywords to update your product/Services.